Back in July, four Armthorpe swimmers made the short trip to Ponds Forge at Sheffield to compete in the National Championships at either Age Group or Youth Level. Caitlin Dixon,Georgia Wright,Alex Pollard and Jarvis Parkinson (all of whom train at DARTES), competed against the top swimmers in the UK, and did us proud! Caitlin swam in the National Youth Championships (for swimmers aged 15 years+). Unfortunately for her, injury had hampered her training for a large part of the season, but she was able to swim through the grueling 800 free to finish 25th. Caitlin also competed in the 200 and 400 free, and the 200 and 400 IM - a busy few days! Georgia swam in four individual events - the 100 and 200 back, and the 400 and 800 free. Her signature stroke came with a cracking PB 1.06.09 in the 100 back, leaving her 15th overall. A great result for her first performance at that level. Alex also had 4 individual events to swim, including the one that most swimmers try their best to avoid - 200 fly! After a long period plagued by illness, Alex swam pretty close to his PB's on 100 fly and 100 back, and we're sure he'll come back with a vengeance this season. Last but not least, Jarvis Parkinson. He competed in 7 individual events, finalled in ALL of them, and came home with 3 gold medals,1 silver, and 3 bronze. 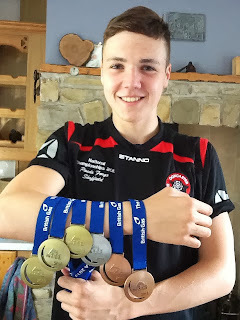 Not content with bringing home the bling, he also became the GB Age Group record holder for the 200 IM in a time of 2.08.02. An awesome performance, and any of our swimmers at Armthorpe should aspire to swim as well as this young man. Well done Jarvis!